This tutorial will show you the ways to prevent deleting of download history in Internet Explorer 9 or above using GPEDIT & REGEDIT. 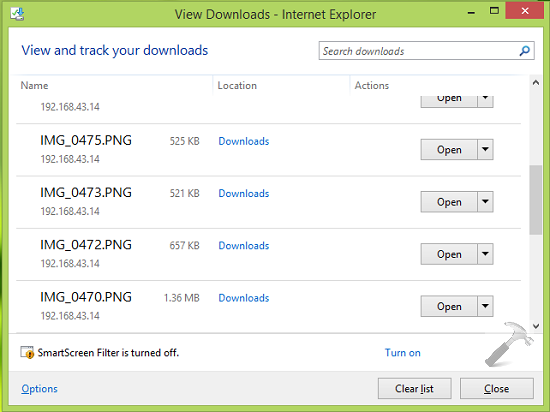 In Internet Explorer, whatever you download, after certain interval, Internet Explorer automatically remove those download history from your system. Now consider a situation when you need to check what you have downloaded a month ago. Now to trace where the download content could be, you won’t be able to find anything since Internet Explorer has erased that entry already. So as a precaution, if you don’t like this default analogy of Internet Explorer to erase download history, you should make it to remember. 4. In the above shown window, select Enabled, click Apply followed by OK. Close the Group Policy Editor and reboot the machine to activate this setting. 3. At this registry location, right click over Internet Explorer key and select New -> Key. Name this subkey as Privacy. Now come to right pane of Privacy such that registry location becomes HKEY_LOCAL_MACHINE\SOFTWARE\Policies\Microsoft\Internet Explorer\Privacy. In the right pane, right click and select New -> DWORD Value. Name the newly created DWORD as CleanDownloadHistory. Obviously, when you create this DWORD, it must have 0 as Value data. So we’re done now. Now close the Registry Editor and reboot to prevent deleting of download history from Internet Explorer.